The use of high quality efficient LED signs for green solutions is a great way of both saving your money and allowing you to become more recognisable on the market, but also to reduce your energy consumption in various branches that make an extensive use of lighting solutions. These are, for example, mining industry, street lighting, car lighting, or even underwater swimmingpool LED lights. There are countless possibilities of making use of eco-LED signs. For instance, the advertising industry is nowadays one of the most rapidly evolving and competitive spheres of activity within the economic field and it needs an efficient and visible methods of advertising in order for companies and firms to be clearly visible on the market. Also, the industrial and other commercial lighting needs are the boosts for LED lighting solutions and LED market growing. The use of traditional lighting methods including fluorescent and halogen lights is extremely expensive in terms of energy consumption. There are several issues that should be considered when deciding on a particular type of banners and their lighting source. LED lights are the best option for parking lighting solutions, bus stops light systems, various stores, libraries, etc.. The fluorescent banners and signs that are still in use in many popular and commonly visited places that offer a great spot for your advertisement campaign, information providing purposes. Using the traditional fluorescent or halogen source of light makes your display both ineffective and poorly visible. The fluorescent billboards are more prone to fast aging whenever subjected to a frequent switching on and off. It has to do withe their cathode erosion each time the light is switched on. After a prolonged switch on and off mode, their electron-emitting surface is burned up and the light has not enough voltage to start up. With this in mind, you have to realise that it will be necessary to replace the used fluorescent bulbs very frequently. The reason is that a dynamic image and text scrolling is the main factor for a good advertisement campaign and source of light for both swimmingpools (LED lights can be additionally protected by the thick layer of silicon to assure their water-proof capabilities), streets, cars and other spaces such as mining areas underground where there is a constant need of a bright and steady ligh source. The high quality and extremely efficient LED panels and signs are a perfect choice for people who want a reliable and multi-use advertising device. 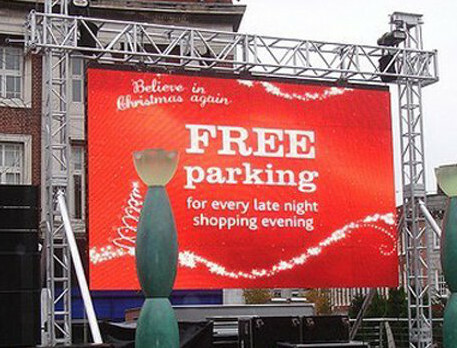 Bearing in mind that LED panels and signs can have a scrolling and visual information display, the only thing you have to do is to specify the appropriate textual or image message to be conveyed and then you can just watch how effectively and vividly your information contrasts with the surrounding area. Since the traditional lighting methods such as fluorescent bulbs do not have any available wireless network connection for choosing the relevant information to be displayed they have to be organised in a fixed pattern and what is worse, the design cannot be changed instantly. As a result, LED lighting methods are extremely efficient for both indoor and outdoor lighting solutions for both domestic and commercial purposes. You can freely use LED bulbs, panel lights, pendant lights, etc., for your house interior lighting systems, but also for various station enlightment, underground tunnels, mine tunnels, and others. It is also more and more natural to use eco-green LED lights for various factory and industrial functional purposes such as control lighting. The effects resulting from choosing the eco LED signs as an advertising tool for your needs will be vastly bigger than in case of the traditional halogen or fluorescent billboards.